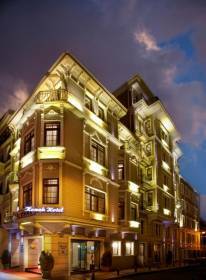 Located 400 meters from the heart of Istanbul, Taksim Square, Konak Hotel in Istanbul, Turkey, offers easy access to restaurants, bars, museums, historical sites, shopping areas and business centers.Hotel Konak features 117 rooms with 234 bed capacity and offers the functionality and comfort combined. You may choose the room type that suits you best from: 3 Suites, 4 Deluxe, 16 Connected and 1 room furnished specially for disabled guest. Hotel Konak has 3 meeting rooms which allow in a lof of natural light.Lütfi Kırdar International Convention and Exhibition Center (ICEC), Istanbul Congress Centre (ICC) and Military Museum where you might attend to business and art related events by 3 minutes walking. Hotel Konak has 3 meeting rooms which allow in a lof of natural light.The Bergama Meetimg room can be seperated in order to be used as two different halls.